Real Performance Machinery L.L.C. (RPM) is a company centered around optimizing it’s customers profitability through the performance of the machinery it sells, manufactures, and refurbishes. RPM’s Rebuilt Machine Works division specializes in the resale of rebuilt printing machines and dryers as well as the contracted rebuilding of customer equipment. In addition RPM/Rebuilt Machine Works designs and builds specialized accessories that enhance machine performance in the form of machine upgrades/retrofits or separate stand alone units. Experience- RPM’s owner Rick Fuqua has 19 years of Graphic Arts Experience and 14 years of experience working for new screen printing machine manufacturing companies and 10 years owning Real Performance Machinery. Rick has a Teaching degree in Graphic Communications and A Masters Degree in Technology Education. Rick holds 13 screen printing machinery patents ranging from complete machine designs of both oval and round presses to flash cure units, pin register systems, and All Over Print Platens to name a few. Prior to starting RPM Rick was part of the management of Elexon L.L.C. for the first 3 years. Rick previously worked for the American Screen Printing Equipment Co. division of Advance Process Supply Co. for 11 years. He held positions ranging from screen print instructor to textile product manager and director of textile product sales & R&D. In the 24 plus years Rick has been involved in the Industry directly he has authored numerous technical application articles for the major trade journals such as Impressions, ScreenPrinting, Printwear, The Press and others, ranging from printing techniques of Dark Garments, Four-Color Process to All Over Printing. Technical equipment articles on press and dryer performance to machine design and troubleshooting machinery. In addition to these many articles Rick has given scores of seminars at various industry trade shows on many of these same topics. Given his commitment to the industry’s education effort it is clear that he understands how machinery must perform to produce the various techniques he lectures on. His understanding of the print process has helped him to design many new products never before available to achieve novel print effects. Many customers have trusted Rick for his insight into the nuts and bolts of getting the print to come out right on both press and prepress issues. Buying an automatic can be one of the biggest decisions many screen print shop owners make. Dealing with knowledgeable and reputable people helps takes the fear of buying a bad machine or the wrong type of machine away. 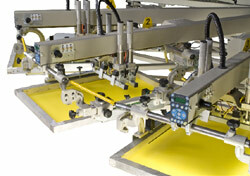 Looking for screen printing machinery? Chances are we just got it in. Please call and ask to speak with the owner Rick Fuqua. 317-876-9230 Mon - Fri 8a.m. - 5p.m.